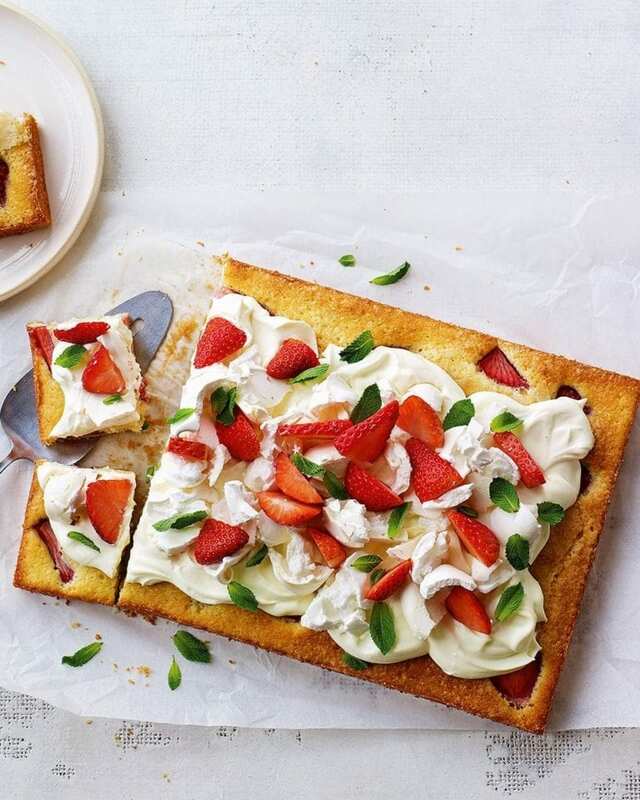 Debbie Major turns the crowdpleasing dessert, Eton mess, into a just-as-good teatime traybake. Heat the oven to 190°C/170°C fan/gas 5. To make the sponge, beat the butter and sugar in a mixing bowl using an electric hand mixer for 5 minutes until light and creamy. Beat in the vanilla bean paste, then mix in the ground almonds. Beat in the eggs one at a time, adding a tablespoon of the flour with the last 2 eggs. Sift over the remaining flour and a pinch of salt and, using a large metal spoon, fold in using a figure-of-eight motion, along with the 4 tbsp double cream. sugar. Bake for 25-30 minutes until a skewer pushed into the centre of the cake comes out clean. Remove the cake from the oven and leave to cool in the tin for 10 minutes. Transfer to a cooling rack, leaving the baking paper in place, and leave to cool completely. To assemble, peel off the baking paper, then transfer the sponge to a serving plate. Whip the 250ml cream and icing sugar in a large mixing bowl until the cream forms soft peaks. Thickly spread the whipped cream on top of the sponge and scatter with the crumbled meringues, strawberries and mint leaves. Cut into even portions to serve. Bake the sponge (and meringues) a day ahead; top just before serving.